Bobbi, an employee, needed intermittent leave due to her condition and contacted the company’s third-party Family and Medical Leave Act (FMLA) administrator to request the leave. Bobbi provided a certification to the third-party administrator (TPA), and her leave was approved. Later, however, Bobbi needed more leave than the original certification indicated, so she provided a doctor’s note indicating that the amount of leave requested was just an estimate, as the doctor was still working toward a diagnosis. After a few days, Bobbi asked the TPA if they updated her FMLA leave parameters. The TPA told Bobbi that she needed a recertification. She complied and, after a few days, Bobbi called the TPA again to see if they had received the recertification. They had not. A couple weeks went by and Bobbi was released to return to work, and she met with her company’s HR department, presenting a return-to-work note from a different doctor. The HR department, however, said the note was insufficient because it needed to come from her treating doctor. About a week later, Bobbi did provide her HR department with a return-to-work note from her treating doctor. Bobbi was not, however, allowed to return to work. The HR department had forwarded the latest return-to-work note to the TPA, and they were waiting for the TPA to handle the situation. Neither Bobbi or her company heard from the TPA for a couple of weeks. The employer finally emailed the TPA about the issue, and the TPA told Bobbi she would need to open a new leave because a new month had begun. The TPA also requested another certification from Bobbi’s doctor. Bobbi did open a new request, and her doctor did provide another certification. Bobbi also provided another return-to-work note. Despite this, the TPA contacted the doctor and asked for specific treatment dates, and for a confirmation that Bobbi did not need a reduced work schedule. During all this, Bobbi was not allowed to return to work. Finally, the TPA told the employer that, a month earlier, it had received confirmation from Bobbi’s doctor that she was able to return to work. Bobbi was subsequently allowed to return to work, but she sued, claiming that the company interfered with her FMLA rights when it delayed her return to work. The company argued that there were various deficiencies in Bobbie’s final documentation. According to the court, however, the issues were not clearly related to Bobbi for weeks. The court went on to say that the TPA was unresponsive for almost a month, despite Bobbi’s contacting the employer to learn why her documentation wasn’t sufficient. The court found that Bobbi made every reasonable effort to provide certification to the employer and the TPA. Neither, however, responded or tried to obtain more information from Bobbi. Therefore, the employer was found to have interfered with the employee’s FMLA rights. The TPA basically dropped the ball, and the employer was held responsible. Employers can’t hide behind a TPA in regard to FMLA rights. This TPA left the employee (and employer) waiting for too long, and the employer paid the price. If you use a TPA, make sure it will not delay responding to FMLA situations. Eagle v. SMG Salt Palace, District Court of Utah, No. 2:17-cv-1132, November 30, 2018. 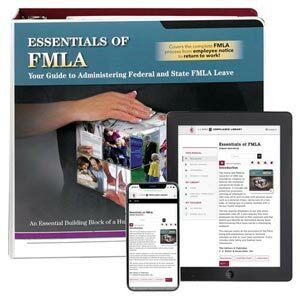 J. J. Keller's Essentials of FMLA manual helps HR pros understand and comply with the FMLA rules, control costs related to leave taken, and minimize the law's potential disruption to their organizations' operations.